1. Push the lever downward to unlock. 2. 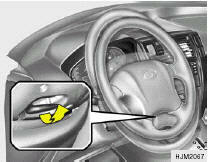 Raise or lower the steering wheel to the desired position. 3. After adjustment, securely tighten the lever by pulling it upward. Do not attempt to adjust the steering wheel while driving as this may result in loss of control of the vehicle which may cause serious injury or death.